FNB filling up as anticipation builds ahead of Beyonce's performance - SABC News - Breaking news, special reports, world, business, sport coverage of all South African current events. Africa's news leader. 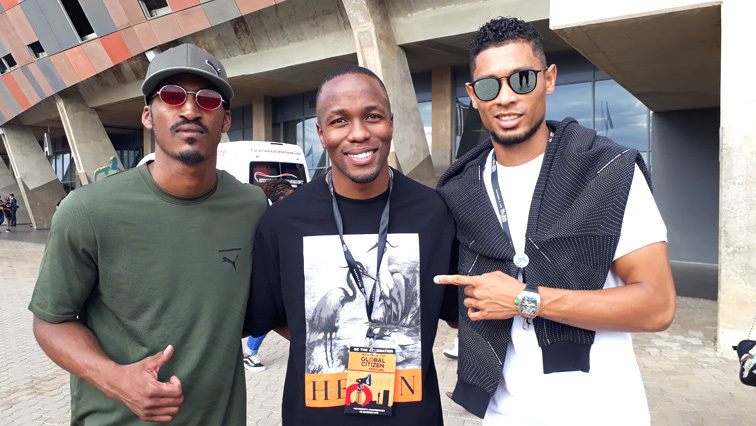 From Left to Right: Henricho Bruintjies, Akani Simbine and Wayde van Niekerk in attendance of the Global Citizen Festival at the FNB Stadium. FNB Stadium is filling up as anticipation builds ahead of the final act of the night, Beyonce at the #GlobalCitizenFestival. Global Citizen Festival: #Mandela100 schedule: Beyoncé & JAY-Z are set to perform a 2-hour set tonight starting 21:22PM SAST / 2:22PM ET / 7:22 PM GMT. Many have come to be part of this once in a lifetime opportunity. Among those gathered here are South African track athletes Wayde van Niekerk, Akani Simbine, and Heinricho Bruintjies. The three have their own favourite artist whom they are looking forward to see; with Bruintjies picking Jay-Z; Simbine “ can’t wait to see Beyonce”; and Van Niekerk says he is here to listen to Ed Sheeran. Yolanda and Barbara are Best Friends Forever (BFFs) who say they woke up at 3am on Sunday morning only to get a seat at the stadium South of Johannesburg at 14h07. Barbara Moagi says she can’t wait to see Beyonce and is not sure if she can contain herself when her performance finally comes. “I am looking forward to Beyonce and I hope I can keep myself from fainting until the end of her set,” says Moagi. Her friend Yolanda says they will have to take turns in the fainting activity or else they will both miss her performance. Zavela Mtubu, from Northriding, says she is looking forward to hearing ‘End of time.’ Her friend Ukho Samela and cousin Nosipho Mtubu say they can’t wait to hear her sing their favourites ‘Grown woman’ and ‘Formation’, respectively. Beyonce and her hip hop star husband, Jay-Z are expected to be the closing acts with their set scheduled to start at 21h30. This entry was posted on 02 Dec 2018,07:00PM at 7:00 PM and is filed under Lifestyle, News, Homepage Featured Story Slider. You can follow any responses to this entry through the RSS 2.0 feed. Both comments and pings are currently closed.